Strictly Success The organizational utopia which Strictly Success strives to achieve consists of recognizing the company, as a whole, to be a single high performance effective team. For anyone that has ever been on a high performance team, they recognize the difference between the rewards of being part of such a team compared to that of a mediocre team. They know how being part of such a team felt, they enjoyed the experience, and to this day, if they are not currently on that team, they are striving to duplicate that effect or team. Strictly Success believe that while the core to every successful team is the individual, ironically, it is the willingness of the individual to subordinate individual goals to those of the team's that will bring the individual their greatest accomplishments. Fact is, peak performance team building results in greater individual AND organizational success! Therein lies the secret to our proven team building results at Strictly Success. Our "High Performance Team Building" workshop includes experiential team exercises designed to confirm the value of the individual, however, to imprint the indispensability of the team in goal accomplishment. Strictly Success further communicate that one cannot hope to be on high performance teams, if personally they are a mediocre performer. Our teambuilding workshops include performance improvement plans, performance assessments and individual and team assessment tools, which can provide specific and immediate feedback for use in moving beyond mediocrity- to peak performance. All efforts are extended with the goal of transforming a mediocre team to one of unlimited possibilities. At Strictly Success, we believe the cornerstone upon which successful teams are built is "integrity". Which is precisely why we include an "Accountability" segment in our team building workshops designed to create an organizational culture of high accountability. Whereas, when a team member commits to an action you will know with certainty it will be done! The spider web, designed to instruct in overcoming limited resources. The "Board Meeting" which challenges previous belief systems via breaking a board with nothing more than a hand and newly acquired knowledge! Our "Mine Fields" created to simulate environments filled with explosive situations and challenges! i perform's Team building trainings are ideal for any growing team leader, for team leaders who need to refresh and update their skills, and for team members who require a better understanding of their importance and function on their team and its value to the team and larger organisation. Each team building workshop or seminar is tailored to the focus group and the needs of its participants. Team building trainings are conducted by our expert, Timothy Millett, Director of Training and Development. Play out vital team skills such as leadership, creative problem-solving, planning, and communication, with our newest game, Maestro: The Team Performance Game. Hands-on and engaging, this interactive game leads to a rich and meaningful dialogue that prepares teams to perform more effectively in the workplace. Teams are challenged when they rehearse to audition for the honor of playing at Carnegie Hall. First, they must decide who will lead the team as maestro. Then they practice together as an ensemble. But the problem is that they don’t know the name of the song they must perform - and they must play it using only hand bells. Worse yet, teams don’t gain access to the instruments until it’s time to audition! The activity draws to a close when teams perform and a winner is chosen by a select panel of judges. Teams experience the real-life team dynamics in the process of forming team roles and responsibilities, planning, and execution. Infuse fun into your next training session. 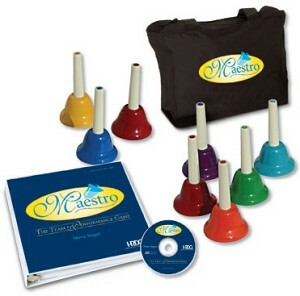 Maestro is the perfect kick-off for your team building initiative, team energizer, or standalone learning event. Learning Outcomes: Give teams the opportunity to experience problem-solving Prepare teams and leaders to develop key team skills Understand leadership under pressure Learn what makes teams successful.